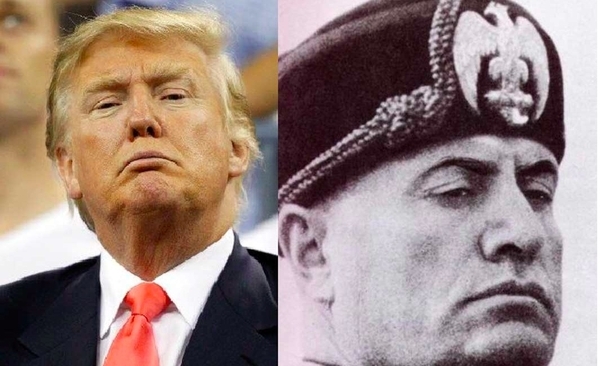 I argued three days ago that Donald Trump resembles Benito Mussolini more than the standard American politician. Here, others pick up on this theme. He promises to "make America great again." But where in his declarations can we find the language of the American creed? Think about it. In all his stump speeches, tweets, and debate performances, how many times have you heard him utter the words liberty, freedom, democracy, Constitution, Founding Fathers, rights, ideals, equality, opportunity? Has he ever quoted the giants of our political pantheon—Lincoln or Jefferson, FDR or Reagan? Unlike every other candidate, Republican and Democratic, in this race and in races past, he completely ignores the ideas at the heart of the American experiment. Instead, he repeats words like winning, great, huge, beat, kill, deals, successful, rich. He quotes himself and his own books. The central idea at the heart of Trumpism is the idea of winning. And winning, by his definition, means beating a loser. From a left-wing perspective, with gratuitous brickbats against conservatives, Fedja Buric made a similar case at Salon in "Trump's not Hitler, he's Mussolini: How GOP anti-intellectualism created a modern fascist movement in America." once in power, Trump will owe them and their party nothing. He will have ridden to power despite the party, catapulted into the White House by a mass following devoted only to him. ... And is a man like Trump, with infinitely greater power in his hands, likely to become more humble, more judicious, more generous, less vengeful than he is today, than he has been his whole life? Does vast power un-corrupt? This is how fascism comes to America, not with jackboots and salutes (although there have been salutes, and a whiff of violence) but with a television huckster, a phony billionaire, a textbook egomaniac "tapping into" popular resentments and insecurities, and with an entire national political party — out of ambition or blind party loyalty, or simply out of fear — falling into line behind him. May 25, 2016 update: Paul Ryan, speaker of the U.S. House of Representatives, has similar concerns about Trump, if more gently stated. He also is in a position to raise these directly with the presumptive nominee: "We want to make darn sure that our standard-bearer understands, appreciates and respects and supports the Constitution and the kinds of principles that come with it, and those are some of the conversations we have been having." June 1, 2016 update: Trump's multiple, personal, and bigoted attacks against U.S. District Judge Gonzalo Curiel, who is presiding over two civil suits against "Trump University," reveals his disdain for another institution of government. "I have a judge who is a hater of Donald Trump, a hater. He's a hater," Trump said at a campaign rally in San Diego, adding that he believed the Indiana-born judge was "Mexican." He also suggested taking action against the judge after the election: "They ought to look into Judge Curiel, because what Judge Curiel is doing is a total disgrace. Okay? But we will come back in November. Wouldn't that be wild if I am president and come back and do a civil case? Where everybody likes it. Okay. This is called life, folks." These statements confirm evidence cited above that Trump believes he can do whatever he damn wants, disregarding institutions, rules, customs, and conventions that underlie the American government. In the words of Case Western Reserve University law professor Jonathan Adler, "He has repeatedly given indications he has no appreciation for the rule of law." Nor does he accept the independence of the judiciary. June 3, 2016 update: Adam Liptak in the New York Times on Trump's disdain for the judiciary: "many conservative and libertarian legal scholars warn that electing Mr. Trump is a recipe for a constitutional crisis." 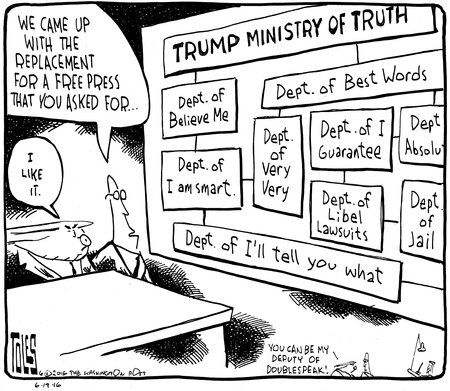 June 19, 2016 update: A Toles cartoon in the Washington Post reveals the future "Trump Ministry of Truth." Remember back half a dozen scandals or so, when it was revealed that Donald Trump used to call reporters and praise himself while pretending to be Donald Trump's publicist? As Ben Domenech wrote, "This is a thing that happened and that Donald Trump admitted happened, both in a court of law and in the press, in 1990 and in 1991." But when the story resurfaced, Trump changed his mind and insisted not only that this thing had never happened, but that he had never previously admitted to it, either. So it was a lie, squared. And then Trump sent out Paul Manafort to dutifully insist on national television that if Trump now says he never pretended to be his own publicist, then Manafort believes him. What's important here isn't the lie, but the fact that Trump knows he's lying, and that Manafort knows he's lying, and that they both know that you know they're lying, too. And that they don't care, because they believe that they hold the authority to make you acquiesce to their version of reality. In Trumpism, lying is an exercise of power. Last goes on to compare this ability to force a lie on followers to the Soviet system, as analyzed by Václav Havel, forcing a greengrocer to put a sign in his shop window proclaiming "Workers of the world, unite!" July 6, 2016 update: A survey by NBC News finds Trump, who lashes out at such fellow Republicans as George W. Bush, John McCain, and Mitt Romney, praising dictators such as Saddam Hussein, Mu'ammar al-Qaddafi, Vladimir Putin, Kim Jong Un, the Chinese Communist Party, and (of course) Benito Mussolini. His preference for tyrants over democratically elected leaders suggests that, contrary to his claim that the Bible is his guide, Friedrich Nietzsche is his real inspiration. July 17, 2016 update 1: Sam Nunberg, a former aide, on Donald Trump: "He started out as the Republicans' Obama, and somehow it's turned into Mussolini." Politicians often make overconfident and undercooked promises to fix things, even if they don't usually use rhetoric that draws so heavily from classic confidence-man tropes. ("You have confidence in me! Believe me, I will solve the problem.") What really sets Trump apart is that he rarely even tries to explain how he will get rid of ISIS, how he will create jobs, how he will make addicts better. He just will. Don't worry about the how. July 21, 2016 update: I build on this analysis today at "Why I Just Quit the Republican Party" and then address the many criticisms against it at "Blowback from Criticizing Trump." A long-term, wage-earner recession (to which Republicans have offered little practical response). Educational mediocrity concentrated in high-poverty communities. Congressional dysfunction. A Supreme Court that seems overly political and outcome driven. Everyone can find some reason for disillusionment. To these failures, there are two possible responses. The first is the institutionalist answer: To rebuild with existing materials. To reform, repair, reclaim and renew our patrimony. The second alternative is the promise of deliverance by a man on horseback — a single leader claiming to embody the interests of "the people." In Cleveland, Trump offered the second option with more forthright clarity than any politician in my lifetime. The speech contained almost no serious discussion of public policy or ideological argumentation. Instead, Trump said: "I am your voice." "I am not able to look the other way." "I know the time for action has come." "I can be your champion." "I will fight for you, and I will win for you." Gerson found the moment surreal. A party with a distinguished history, generally led by men and women of public spirit and decency, has embraced a demagogue who may be a genuine threat to American democracy. is cultivating a state of panic to increase public tolerance for political risk — in this case, the risk of a candidate who is untested, unprepared, unstable and unfit. And the requisite sense of emergency is being created by populating American nightmares with migrants, refugees and Muslims. Standing on the convention floor, I could see what the face of American authoritarianism might look like. I can't recall a Republican speech in my lifetime that put such an overwhelming emphasis on the ability of a national leader to transform American lives. I and I alone will protect Americans from ISIS, from domestic crime, and from the free market, Trump declared. Corporations won't move their factories, wages will increase, and trade will suddenly become fair. How? Don't ask. He'll make it so. Nor can I remember a modern Republican speech that put less emphasis on life, liberty, or the Constitution. He never mentioned abortion or Roe v. Wade. His discussion of religious liberty focused entirely around the Johnson Amendment — obscure legislation that has kept churches out of politics — and neglected the far more grave concerns about the independence and even existence of religious institutions in the face of increasingly militant secular progressives. In a speech that lasted 75 minutes and felt even longer, he used the word "freedom" once. "Liberty" was nowhere to be found. in one of the best-received lines of the speech, he told us, of our "rigged" system: "I alone can fix it." Fix it with his own party's leadership in Congress, or with an aroused populace? No. "I alone can fix it." In so many other ways, Trump presented himself as a man alone, imbued with the power to do what no other person or institution can do. Consider how he described his visits to "the laid-off factory workers, and the communities crushed by our horrible and unfair trade deals. These are the forgotten men and women of our country. People who work hard but no longer have a voice. I am your voice." "the crime and violence that today afflicts our nation will soon come to an end." "On the economy, I will outline reforms to add millions of new jobs and trillions in new wealth that can be used to rebuild America." "On January 21st of 2017, the day after I take the oath of office, Americans will finally wake up in a country where the laws of the United States are enforced." "I am going to bring our jobs back to Ohio... and to America – and I am not going to let companies move to other countries, firing their employees along the way, without consequences." Greenfield finds in this speech the clue to Trump's political philosophy: "It is Caesarism: belief in a leader of great strength who, by force of personality, imposes order on a land plagued by danger." That in turn explains the bleak quality of his presentation: "because nations fall under the sway of a Caesar only when they are engulfed by fear. And the subtext of this acceptance speech was: be afraid; be very afraid." Trump doesn't even pretend to have an ideology. His main idea is that he is great, and if the country elects him, he will make it greater. "Share my glory," cries Evita in the Andrew Lloyd Webber production, which is what Trump promises his supporters as well. It is ironic that Trump rails against Latino immigrants given that his campaign seems to mirror those of Latin America's Peronists, believing in the strongman above any set of ideas. The Peronist feel is reinforced by the cringeworthy emphasis on Trump's children, who were filmed throughout the convention smiling beatifically and waving at adoring crowds from the royal box. (Bill Maher makes a similar point.) In good dynastic fashion, they are his key deputies in business and the campaign. As The Post pointed out, "there are as many Trumps speaking . . . as sitting senators." In fact, a highlight of every evening has been a speech by a member of the family. And while the family got pride of place, Trump retainers were also showcased. Not one of the Republican Party's five living former nominees (two of whom were presidents) spoke, but the manager of Trump Winery got a nice slot, as did an assistant to the kids. xenophobia, ultra-nationalism parading as patriotism, anti-media and anti-free speech, the stressing of old-fashioned hierarchies such as authority, obedience, militarism, hard-work and discipline, the restoration of glory and greatness, ideological purity, the redressing of perceived social injustices, populism. Useful to remember too that Mussolini began his career not as a fascist but as a socialist in sympathy with the plight of the disadvantaged but then opportunistically changed direction when the political winds changed; something hat Trump has also done, for he began as a pro-choice democrat who is now a pro-life republican. The appeal to the gay community, trying to blame its persecution not on native bigotry but on international terrorism (hence the Orlando outrage prominently mentioned), is also intriguing. even the body language and the gestures that appeared during the one-hour-plus-speech were uncannily and familiarly Mussolinesques. That raising of the chin with a firmly clenched mouth and a raised finger, that pose of determination and intransigence affirming one's superiority. All that was needed was a war helmet and the resemblance would have been perfect. Some have gone as far as suggesting that we were witnessing a veritable reincarnation or rebirth of the infamous dictator. Nowhere in his speech did Trump give any sense that he knew — or cared — how he would get things done through his "sheer force of will." That's the thing about magical thinking, you don't need to explain it. The Ones We've Been Waiting For get it, and everyone else never will. "I don't think people have fully recognized the degree to which he's transformed the party," said Richard Spencer, a clean-cut 38-year-old from Arlington, Virginia, who sipped Manhattans as he matter-of-factly called for removing African-Americans, Hispanics and Jews from the United States. Like most in his group, Spencer said this year's convention was his first. On his social media accounts, he posted pictures of himself wearing a red Trump "Make America Great Again" hat at Quicken Loans Arena. Spencer and a handful of like-minded friends, most wearing convention credentials and Trump paraphernalia, said the nativist overtones — and the series of tweets over the last year — marked a clear nod to them. "Trust me. Trump thinks like me," Spencer said. "Do you think it's a coincidence that everybody like me loves Trump and supports him?" July 25, 2016 update 1: In a June 20, 2016 update, above, Jonathan Last points out how Trump forced his campaign manager, Paul Manafort, to lie for him about his having pretended to be his own publicist, with the punch line "In Trumpism, lying is an exercise of power." Trump wasn't claiming to be passing on "factual information" when he linked Sen. Ted Cruz's dad to President Kennedy assassin Lee Harvey Oswald a day after accepting the Republican presidential nomination. "He's got a right to talk about whatever he wants to talk about, however, I don't think he was ever saying this was some sort of factual information," Priebus said at a press conference on the eve of the Democratic National Convention. "It was something he referred to. He's talked about it, he's gotten off from it. As far as I'm concerned, we can move on from it." In May, Trump first attempted to link Cruz's father to JFK's assassin, and he reiterated it again on Friday, following the uproar over Cruz's decision not to endorse Trump in his Wednesday convention speech. "I think he mentioned it in passing and everybody glommed onto it and it became a controversy, but I think as far as the overall picture of Donald Trump," Priebus said, "I mean, that is one rhetorical issue that you can all debate until the cows come home, but it doesn't identify the Donald Trump campaign." So, in brief, Priebus is telling us that Trump never made the accusation he made and it does not matter. Comment: I wonder who Trump will next bend to his will through lying. Paul Ryan? Mitch McConnell? Mike Pence? large majorities of Americans tell pollsters they believe the nation is on the " wrong track." It is customary for the out-of-power party — in this case, the GOP — to try to capitalize on such dissatisfaction. But Trump is doing so in a way that is alien to our political tradition. He does not offer the Republican Party as a solution; nor does he present a set of realistic policies or even a coherent philosophy. He offers himself. "I alone" can fix a broken system, Trump declared. "People who work hard but no longer have a voice: I am your voice." It was a speech that could have been delivered from a balcony in a banana republic. I couldn't help but think back to the years I spent covering South America as a foreign correspondent for The Post. The politician who comes to mind is Juan Perón, the Argentine strongman whose ideology was similarly self-contradictory — and whose legacy was to turn his prosperous nation into an economic and political basket case. was as close to a fascist spectacle as anything in history of modern American politics. The extent to which Trump delegates took enormous pleasure in hatred and in flouting the rule of law was most in evidence when New Jersey Governor Chris Christie turned the delegates into a mob bellowing "lock her up" as he played the part of prosecutor of Hillary Clinton. The call and response of Christie's speech was, like Trump, a moment of liberation from civility and decency, when the mob could take pleasure in venting all of its hatred and resentments at Clinton. Trump's acceptance speech offered no substance, repeated the adolescent insult about "crooked Hillary," and then revealed what had been obvious all along, namely that he believed that "I alone" will be able to restore law and order and make America great again. The delegates in the hall loved it. Oct. 10, 2016 update: In the second debate with Hillary Clinton, Trump threatened: "If I win, I am going to instruct my attorney general to get a special prosecutor to look into your [deleted e-mail] situation." Clinton responded that "It's just awfully good that someone with the temperament of Donald Trump is not in charge of the law in our country." Trump replied to this, "Because you'd be in jail." Comment: Trump's threat to jail his election opponent is pure fascism. Trump alternatively expressed his admiration for dictators and emulated their "Big Lie" techniques for winning and keeping power. If we needed any more evidence, the debate showed just what an unprincipled power-seeker Trump is — how he is willing to say or do anything, to cross any line, to violate any norm of civilized behavior, in order to feed his insatiable ego. He came across as the kind of unscrupulous demagogue that has imperiled other democracies and that the United States has not seen since the heyday of Huey Long and George Wallace. Trump's remarks, which he read from a teleprompter, were laced with the kind of global conspiracies and invective common in the writings of the alternative-right, white-nationalist activists who see him as their champion. Some critics also heard echoes of historical anti-Semitic slurs in Trump's allegations that [Hillary] Clinton "meets in secret with international banks to plot the destruction of U.S. sovereignty" and that media and financial elites were part of a soulless cabal out to destroy "our great civilization." More than any book I've read or lecture I've attended, the Trump phenomenon has explained the 1930s for me. Witnessing so many otherwise rational people fall for the lies of a demagogic con man who promises that he "alone" can "fix" all of our country's problems and bleats about throwing his opponent in jail (when he's not urging his raucous crowds to kill her), one begins to fathom how a modern, educated, advanced country like Germany went Nazi. You already see the stirrings of a nascent fascist movement in America. The parallels between the GOP's amoral cowards willing to do anything to achieve power and the German leaders who thought Hitler could be "controlled" are as pathetic as they are frightening. May 12, 2017 update: Henry Scott Wallace emphasizes the corporatist aspect of fascism ("a merger of state and corporate power") to make the case in "American Fascism, in 1944 and Today" for Trump fitting the mold. Feb. 5, 2018 update: Not clapping = treason? -called reporters "enemies of the people"